A gift of $25 million has been made to the University of Notre Dame for the construction of O’Neill Hall, adjacent to the south end of Notre Dame Stadium. The building will be named in honor of Notre Dame alumnus and Trustee Joseph I. O’Neill III. The gift was made to the University by Helen Schwab and her husband, Charles, in honor of her brother Joe O’Neill. The Schwabs are significant donors to the University and major donors to O’Neill Family Hall. O’Neill Hall joins Corbett Family Hall and the Duncan Student Center as the three structures surrounding Notre Dame Stadium. It will be a six-story, 100,000-square-foot building for the Department of Music, the Sacred Music at Notre Dame program and hospitality space, with completion scheduled for August. A 1967 Notre Dame graduate with a degree in finance, O’Neill earned a master of business administration degree from the University of Michigan a year later and then served in the U.S. Army Special Forces. He is the managing partner of O’Neill Properties Ltd. in Midland, Texas. O’Neill is a past president of the Notre Dame Alumni Association’s Board of Directors and, in that capacity, served for two years as an ex officio member of the University’s Board of Trustees. He served for nine years on the College of Engineering Advisory Council before his election to the University Board of Trustees in 2001. In 2012, O’Neill received an honorary degree from the University, and in 2013 the Alumni Association bestowed the Rev. Edward F. Sorin, C.S.C., Award on him for distinguished service to the University. O’Neill is chair of the Midland Memorial Hospital Foundation and serves on the hospital’s board of governors. He also is on the board of governors for the High Sky Children’s Ranch and the executive committee of the Texas Oil and Gas Association and the U.S. Oil and Gas Association. O’Neill and his wife, Jan, have two children, Catherine, class of 2002, and Flynn, class of 2011. O’Neill Family Hall, a men’s residence hall on Notre Dame’s West Quad, was underwritten with a gift from the O’Neills, Schwabs, and Joe and Helen’s father, Joseph I. O’Neill Jr. The building is named for the family, with a particular honor for Mr. O’Neill Jr., a 1937 Notre Dame alumnus and a monogram winner in football and baseball, who founded O’Neill Properties. The elder O’Neill also served as president of the Notre Dame Alumni Association and as a University Trustee. In addition to the residence hall, the O’Neills also have provided a gift to Notre Dame for a longitudinal sundial on the south side of Jordan Hall of Science and are members of the President’s Circle, Sorin Society, and Badin Guild. O’Neill Hall will include two 2,200-square-foot halls for rehearsals and concert performances, the library for both the Department of Music and Sacred Music program, a music lab for studio production, a lecture hall, classrooms and seminar rooms, rehearsal rooms, numerous practice rooms of varying sizes, four organ practice rooms, and faculty offices. The 18,000-square-foot club on the third level will provide hospitality space on football weekends and throughout the week. 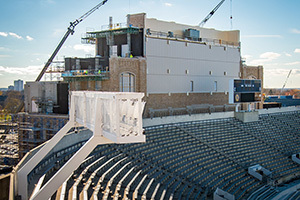 In addition, the first level of O’Neill Hall will serve as a primary entrance to Notre Dame Stadium through the Frank Leahy Gate. The Department of Music provides an intensive course of study for music majors within Notre Dame’s liberal arts tradition. Students study performance, music theory, music history, and ethnomusicology in collaboration with an accomplished faculty of performers and scholars. The department also contributes to the broader musical life on campus through course offerings and numerous ensemble opportunities for majors and non-majors alike. Formal study of music at Notre Dame is complemented by the department’s extensive presentation of faculty and guest artist concerts, scholarly lectures, and student performances. Sacred Music at Notre Dame was established as an independent program of the College of Arts and Letters in 2014. It awards a master of sacred music degree in organ performance, in choral conducting, and in voice, and a doctorate in musical arts degree in organ and in choral conducting. The Notre Dame Children’s Choir, a lab for graduate students training over 200 local children and teens, is integral to the program’s mission. Many graduate students serve as interns in local churches and musical ensembles, en route to roles of leadership in the academy, churches, and the community.